With so many people and tasks to manage, achieving your biggest goals will require technology that’s customized to your needs, and supported by a team of experts. Real estate and property management companies rely on technology to coordinate their work. In an increasingly complex industry, collecting renovation bids, managing leases and occupancy, handling maintenance requests, and overseeing property security are just a few of the tasks they manage daily. Technology dictates if those tasks are being handled efficiently, or if valuable time and productivity are being wasted. 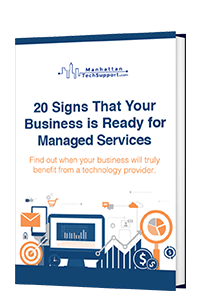 Manhattan Tech Support has been serving the technology needs of real estate and property management firms for over twenty years, so we understand the technology you need to thrive. The network expertise we provide helps real estate firms organize and manage staff, bring clarity and order to tenant requests, and increase profitability through better teamwork and communication — and that’s just the beginning. The newest wave of property technology or “proptech” is having a concrete positive impact on the bottom line of companies in the real estate industry. By combining IoT devices, mobile technology, and cloud computing, our engineers can help you extract maximum value from these new technologies. The experts at Manhattan Tech Support hold certifications from Microsoft, Dell, Google, Cisco, and other leading technology vendors. Those certifications — combined with our two decades of experience building and supporting business technology — make us the top choice for real estate companies in New York City. From network and infrastructure services to custom software development that’s tailored to meet the needs of your business, we help real estate companies maximize the impact of their IT budget. There are many good reasons to move toward a paperless office, but these initiatives often get held up by technical and cultural problems, including employee habits, a lack of centralized document management processes, and other issues. We’ll help you examine your work processes and audit your systems to see which are ready for a paperless transition while staying focused on cybersecurity and regulatory compliance. Save the money associated with printing and storing physical files. Paperless operations make it easier for your team to innovate and solve problems. Staff and clients will both appreciate the faster, streamlined experience. A well-implemented security camera solution can help bring about a decrease in burglary attempts and other crimes. In addition, camera solutions can also help reduce liability for your company and prevent unwelcome visitors from using parking lots or property resources. Manhattan Tech Support engineers combine their cloud expertise with their experience servicing the real estate industry to build and manage reliable, cloud-based security cameras solutions. Our solutions, which use hardware from leading vendors like Cisco Meraki, provide dashboards that are accessible through a standard web browser, allowing you to view and arrange video feeds for multiple physical locations from a single computer without the need for specialized software. The real estate industry doesn’t feel the effect of strong federal compliance standards like the financial services or medical industries. An unintended consequence of this is that, according to research by KPMG, more than half of companies in the real estate industry feel unprepared for cyber attacks. Reliable VPN connections enable staff at different offices to communicate and share data securely, but building one takes the careful coordination of hardware and software resources. Is your VPN client compatible with all your network devices? Will your VPN protocols work smoothly with the endpoints (firewalls, routers, VPN concentrators, etc.) in your system? These are some of the questions we’ll help you answer when we customize and deploy a secure VPN solution for your company. Over two decades, we’ve become the technology services partner that real estate companies in NYC trust with their network and custom software development. With world-class 24/7 customer service, dependable IT help desk with friendly and skilled professionals, and our team of certified engineers, we’re ready to help your real estate or property management company build and maintain the technology it needs to thrive. Have a question for our team? Call us anytime at 212-299-7673. We’re always happy to help!